Late October is an amazing time to visit Hawaii — the weather’s not too hot or too cold, the trades are usually blowing, and the crowds have all gone back home. What’s more — you get to take advantage of all the ghoulish fun in the islands leading up to Halloween! So, we’ve put together a list of the family-friendly Hawaii Halloween events for you, courtesy of the Honolulu Star Advertiser. “Fright Light” laser light show: Through Oct. 31, Bishop Museum Planetarium. Halloween-themed show featuring “Thriller,” “Purple People Eater” and other classics. Twenty-five-minute show at noon and 2:30 p.m. daily (except Oct. 30). Cost: $5. Forty-five-minute show at 7 p.m. Fridays and Saturdays. Cost: $10 general, $7 ages 4-12; museum admission required for both shows. For details and advance tickets, visit bishopmuseum.org. Tricks and Treats at Tony Roma’s: Enjoy magical tricks by Alan Arita, balloons and goodie bags by Suzette, 6:30 to 8:30 p.m. Oct. 27, Tony Roma’s Westridge. Kids ages 10 and under eat free with each paid adult entree. Call 487-9911. Spooky Reel Camps for Girls: 4 to 7 p.m. Oct. 28 and 9 a.m. to 7 p.m. Oct. 29 and 30, Hawaii Filmmakers Collective, 3167 Waialae Ave., with a screening night on Halloween at 7 p.m. Participants should prepare story outline, props and cast; help offered with camera and editing. For ages 13 to 19. Cost: $150 or pay what you can. Register by today. Visit 808ne.ws/2dL67EA. Circus Freak Show: Family-friendly haunted house, 5 to 8 p.m. Oct. 28-30 and 5 to 9 p.m. Oct. 31, Princess Kaiulani Hotel, Kaiulani wing, lobby area, 120 Kaiulani Ave. Parking validation with purchase at a restaurant. Donation: $5. Proceeds to benefit Aloha United Way. Call 753-3261. Hokulani Imaginarium’s Haunted Village: 6 to 8:30 p.m. Oct. 28, Windward Community College. Features a “Nightwalk” show ($4) consisting of a 15-minute virtual tour every 20 minutes until 8 p.m., Dr. Phrankenstein’s Phantom Physics Lab exploring magic and illusions through activities and demonstrations, a Halloween light show, spooky storytelling, face painting and costume contest (cutest, scariest and most creative) with judging from 6:15 to 7:45 p.m. Call 235-7350 or visit 808ne.ws/1NQRIkR. Creepy Crawl Fun Run/Walk: 7:30 a.m. Oct. 29, begins and ends at Keehi Lagoon Beach Park; keiki course lined with trick-or-treat stations. Prizes for best costumes and best guesses of finishing times. Packet pickup 7 to 11 a.m. Oct. 26 at Kalapawai Cafe, 750 Kailua Road, or 6:30 to 7:15 a.m. on event day at the site. Cost (includes T-shirt): $40 ($25 for ages 3 to 12). Visit 808ne.ws/2cT5trP. “No Tricks Just Treats”: 10 a.m. to 1 p.m. Oct. 29, Aikahi Park Shopping Center, 25 Kaneohe Bay Drive, Kailua, with trick-or-treating, prize giveaways, a “Howl-Ween” costume contest for ages 12 and under, Trunk & Treat(ing) at Cars & Coffee Hawaii Auto Meet-up, Color Your Own Boo-Tiful Halloween Bag for the first 200 keiki and more. Call 722-6467. At the Art Explorium, you can create spooky glow jars using recycled jars and acrylic paint. Family story time: “Monster Mania,” 10:30 a.m. Oct. 29, Waianae Public Library, with stories, crafts and songs for keiki in pre-K through first grade. Call 697-7868. Night Insect Safari: 6 to 8 p.m. Oct. 29, Hawaii Nature Center. Use nocturnal collection techniques to attract and examine a variety of night insects while learning why light is attractive to these creatures. Led by entomologist Steve Montgomery. For ages 6 and older. Cost: $10. For reservations, call 955-0100, ext 118. Super Hero Surf Jam: 2 to 4 p.m. Oct. 30, Turtle Bay Resort. Open to surfers of all ages and skill levels who will be judged on moves including best wipeout and best headstand. $5 entry fee benefits AccessSurf for persons with disabilities. Call 293-6000 or visit turtlebayresort.com. 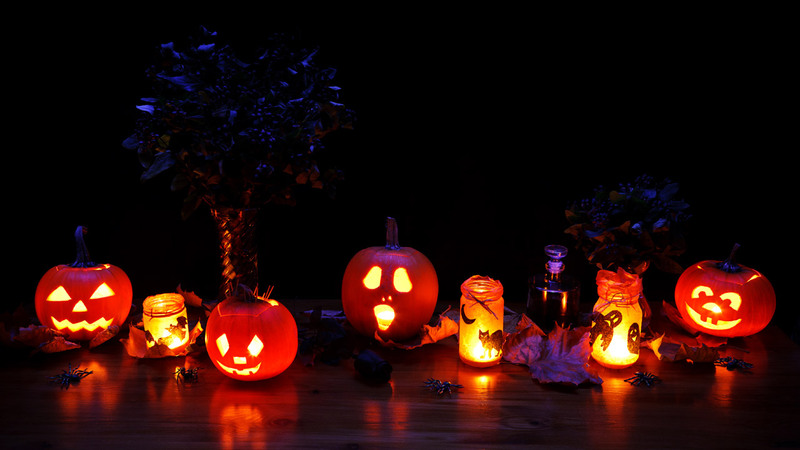 Halloween glow jars: 2:30 to 4 p.m. Oct. 30, Art Explorium, 1142 Koko Head Ave. Create spooky glow jars using recycled jars and acrylic paint. For ages 5 and older. Cost: $15. Visit artexplorium.org/workshops. Family Fun at Kapolei Shopping Center: 5 to 7 p.m. Oct. 31, 590 Farrington Highway. Featuring trick-or-treating, make-and-take crafts and a visit to pumpkin patch (near Safeway) to select a free miniature pumpkin, while supplies last. Visit kapoleishopping.com. “A Fang-Tastic Halloween”: 5-7 p.m. Oct. 31, Mililani Shopping Center, 95-221 Kipapa Drive and 95-390 Kuahelani Ave., with costume contest for all ages and a separate competition for pets (both begin 6 p.m., with check-in at 5 p.m.), prize giveaways, trick-or-treating and more. Call 722-6467. A Hallelujah Blast: 6 to 8 p.m. Oct. 31, First Baptist Church of Wahiawa, 1233 California Ave., with food, candy, games, inflatable bounce castle, prize drawings for bicycles at 7:30 p.m. Call 622-4321. These Halloween events are the perfect compliment to a day of exploring Sea Life Park, parasailing, or stand-up paddling, especially for the little ones. Who says you have to be scared out-of-your-mind to have fun this Halloween?! Instead, opt for one of these family-friendly Hawaii Halloween Events and skip the nightmares!